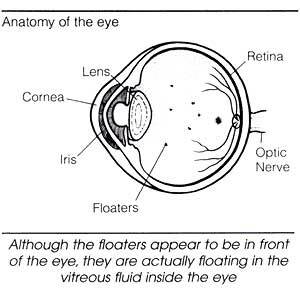 Vitreous Floaters are small particles of gel or cells inside the clear gel-like fluid that fills the eye called the vitreous. The shadows from these particles are seen by the patient and may look like dots, circles, lines, clouds or cobwebs that float in and out of vision throughout the day. The aging process is the main cause of vitreous floaters. 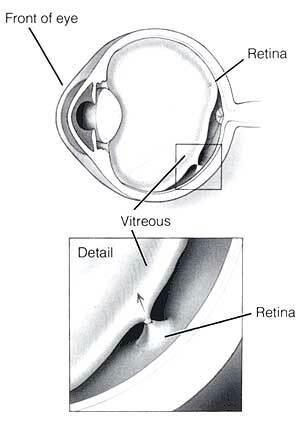 As a person ages the vitreous inside the eye begins to shrink and pull away from the retina, forming clumps or strands. When the vitreous pulls away from the retina it causes a posterior vitreous detachments, which is more common in people who are nearsighted or those who have had cataract surgery and yag laser. Although floaters are a harmless distraction, they can sometimes be a symptom of a more serious problem. Anyone who notices floaters, especially the sudden onset of a large amount of floaters, should be seen by an ophthalmologist to determine the cause the floaters. In most cases, treatment is not indicated for floaters unless they are the symptom of a treatable retinal disease. Flashes are caused by the vitreous gel pulling on the retina. These lightning streaks or flashes can appear occasionally over a period of several weeks or month. It is more common to experience flashes of light as aging progresses. However, a sudden appearance of flashes should be evaluated immediately by an ophthalmologist in order to rule out a serious condition.